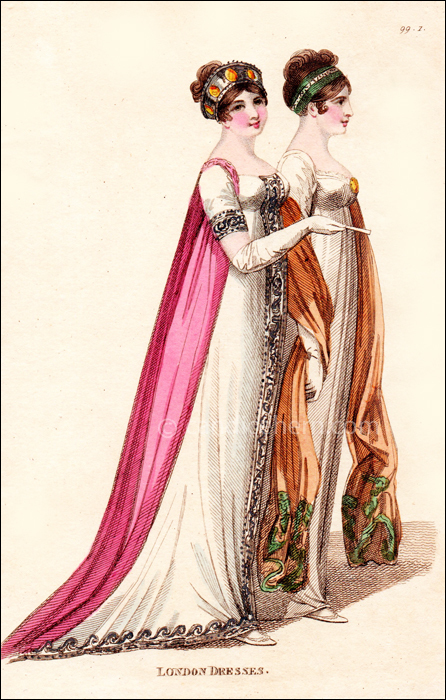 Fashions of London and Paris, April 1806. The cover of this monthly magazine always includes a note that the figures in the prints are “faithfully drawn from the real Life, in the most fashionable Circles.” These two ladies certainly look as if they are among the fashionable set! “Fig. 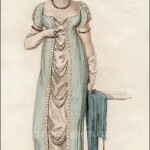 1–A loose robe of undressed crape over a dress of white satin, or sarsnet, embroidered all round with silver; the sleeves quite plain and embroidered to correspond with the dress. A tiara of silver or steel, adorned with gems or cornelians. White gloves and shoes. The suggestion of a tiara of steel refers to faceted and polished steel, which was very popular in both jewelry and the decorative arts of the period. 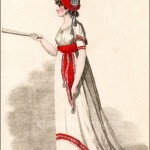 Like all ladies’ magazines of the Regency period, Fashions of London and Paris often used prints that were often copied from the French magazine Journal de Dames et des Modes. 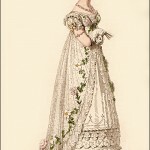 The French publication almost always showed only a single figure in a print, whereas the German, Belgian, and Italian editions of the magazine typically combined figures from two French prints into one. 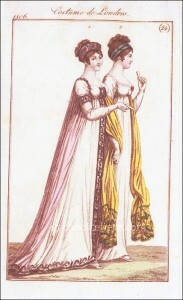 This British print was copied from a German edition of Journal des Dames et des Modes, as seen here.